Safest Beach Tents For Toddlers | Awesome Baby Beach Tent Ever! Home » Beach » Best Beach Tents For Toddlers – Safest Beach Tent. Best Beach Tents For Toddlers – Safest Beach Tent. Remember as a parent you have to protect your little ones from the harmful sun and even harsh wind but it’s only when you get one of the best beach tents for toddlers on the market. The best beach tent for baby will provide your child with shade and protection from sun, wind, cold sand and biting insects. It’s also a good place for them to be changed, take a nap and also play while mommy and daddy enjoy the beach. Buying Guide For The Beach Tents For Toddlers. There are so many beach tents for toddlers coming up in the market and choosing just one can be a hard task. One may assume that beach tents for babies should be small in size but the reality is that you will also find yourself in the tent playing, changing or feeding your child. With that in mind, you should consider a size that can fit a couple of people keeping in mind the number of your family members so no one will be left out. The best beach tents for toddlers must be able to protect you from sun, wind, rain and sand storms. They should be made of a material that has UPF50+ and water resistant while the floor must also not let in water or sand dampness. The best pop up beach tent for baby must be comfortable for the users and especially the child. Comfort means that you should not feel the impact of the sun when you are inside so it should be breathable and cool. A good tent must have ample ventilation that includes windows and it should provide privacy in case you sleep or want to change. Parents who travel with kids know how hard it can be to carry the child, luggage and an umbrella with only two hands. The best beach tents for toddlers should be so easy to set up and take down that one mom or dad can do it without any help or putting the baby down and that is why pop up tents are the best. The extra features on a tent make things so much easier and better so you can enjoy the outdoors to the fullest. A beach tent for baby uv protection that has hooks, pockets and a protective floor is much better than just a plain tent so always be on the lookout for those. What is the Safest Toddler And Baby Beach Tent? 1. Lightspeed Outdoors XL Sport Shelter Instant Pop Up. One of the reasons why this Lightspeed Outdoors XL is the best beach shelter is because it’s not just a baby tent; it can also fit four adults and full size chairs so it’s ideal for the whole family. The Lightspeed XL is also one of the few baby tents for the beach where you can see everything that is going on around you when you are inside thanks to the tall mesh windows. This pop up tent has a side-pull style hub system so it only takes seconds to set up and take down. It’s a great tent for any outdoor event because it offers ample protection against rain, wind and sun and it also has attached shades to offer extra protection and privacy. This baby sun tent will not blow away when it’s windy because it comes with three sand pockets, stakes and guylines to increase stability. It’s easy to set up alone if you are a strong person but otherwise you might need a hand. 2. Pacific Breeze Easy Up Beach Tent Deluxe XL. The Pacific Breeze Deluxe XL is the best baby beach tent for outdoor activities as it provides perfect protection from the sun, rain and winds thus your babies’ safety is guaranteed. It is made from breathable polyester that is child friendly and it is water repellent. The infant beach tent is extra-large thus can accommodate three to four people allowing you to have more fun with your child and the three large windows allowing maximum ventilation. These beach tents for kids are the easiest to set up and very fast to take them down. They have interior pockets and strong hooks that allow you to keep and hang your personal items that you need for the outdoor activities. It is made with a lightweight durable fiberglass frame that holds the tent and comes with a carrying case for proper storage. After a few hours under the sun the tent tends to get hotter. 3. Lightspeed Outdoors Quick Cabana Beach Tent Sun Shelter. If you are looking forward to having a relaxing moment with your baby at the beach, then you need the Lightspeed Outdoors Quick Cabana as it has a large porch space that can accommodate two adults and children. It has well situated mesh windows with shades thus enhancing air ventilation and privacy. This shelter comes with awesome accessories that include an umbrella and its PU coated thus protecting you from getting wet when it rains. It has sand pockets and eight heavy duty plastic stakes that are easy to stick on grass and sand. The baby tent for beach has a strong carrying case that is spacious thus can accommodate the tent even after use and the shoulder straps makes it easy to carry from one place to the other. The Lightspeed Cabana has guy lines that help to increase stability and it comes in different colors that your baby will love. There complaints that the plastic stakes are not durable thus after a while you need to replace them. 4. Pacific Breeze EasyUp Beach Tent. This Pacific Breeze blue beautiful tent is one of the best beach tents for toddlers if you want to enjoy some outdoor activities such as the beach, camping and picnics. This amazing tent is made of breathable polyester which is water repellent thus you will enjoy your summer trip with no worries. It has a fiberglass frame that guarantees durability and it is very large thus creating more space for you and your baby to have the best play time ever. The baby beach tent is lightweight thus easy to transport and it provides perfect shade for your baby from the sun, rain and wind thus no sunburns or wetness. This awesome beach shade tent has lovely outdoor accessories that include a beautifully designed carrying case that perfectly fits your tent and four stakes that you can use on grass, beach and dirt fields. The tent has large windows that allow free air circulation and the large sand pockets allow your tent to stay intact even when it’s very windy. When setting it up you need to be gentle as it can easily tear up. This amazing Genji Sports Pop Up Family beach tent for baby is ideal for family outdoor activities as it automatically pops up and opens in a second and it’s easy to fold back down thus making it more convenient. It is made from flame resistant nylon fabric that is UPF coated thus protecting you and your baby from harmful sun rays. With this baby sun shade tent you can open wide the front and back since you can fully open the zip panel and allow you and your family to have a perfect view of the beach. It has two large side screen windows with roll up covers for ventilation and it is lightweight thus easy to carry. Genji Sports Beach tent for babies has strong durable steel beam frame and for maximum stability you have four plastic stakes, sand pockets and side panels. This baby shade tent is perfect for your baby and it is worth every penny. The stakes are very short and thick making it hard for them to hold the tent in soft sand and windy conditions. 5. Coleman Road Trip Beach Shade. This colorful Coleman Road Trip shade tent for beach is lightweight and compact to travel with and it is very easy to set up and fold. It is made from UV guard material that perfectly protects you from direct sun light thus no sunburns. Coleman Road Beach Shade for babies comes with a carrying bag that is large enough so you will have no struggles when putting the tent back after use and the sand pockets work perfectly on a windy day at the beach. It has four hanging pockets that allow you keep your personal belongings like mobile phones and toys for your baby. The baby sun tent for beach is large enough to accommodate your family and if you are feeling a little bit hot you can just open the front and back and just relax. The stakes are extra-large thus perfect for pitching at the beach and it has a beautiful floor mat that is perfect for your baby to lie on. There are complaints that the carrying bag is of low quality. 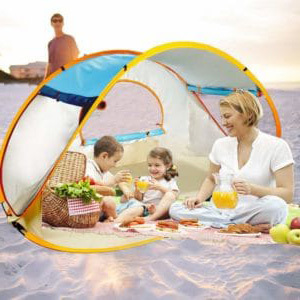 With this beach tents for toddlers review, you have an idea of what is best for your kid and your family. All these tents are different in one way or another but they are all made to protect your precious family so they can have fun. Best Beach Coolers On The Market. Best Beach Wagon For Toddlers – Wagons for Kids. What Are the Different Types Of Beach Chairs? A Detailed Guide To High Off The Ground Beach Chairs. Best Beach Chairs For Over 300 Lbs That are Safe and Comfortable. Best Medium Sized Cooler For Beach and Outdoor Fun. Beach Shade Tent For A Baby – Beach Tent For Kids.